Israeli security service operatives infiltrated a hospital in the Palestinian West Bank on Thursday, killing a bystander while attempting to detain a suspect who allegedly carried out a stabbing, local sources say. Jehad Shawar, director of Al Ahly Hospital in the West Bank city of Hebron, told Palestinian radio around 30 men arrived at the scene in two vans and entered the hospital building with a person pretending to be pregnant, Reuters reports. The Israeli forces infiltrated the hospital to arrest a Palestinian named Abdallah Azzam al-Shalalda, 27, who allegedly stabbed an Israeli settler near Hebron two weeks ago. CCTV footage from the hospital shows armed men, all dressed as Arabs, some of them bearded or covering their faces, bursting into the corridor, aiming guns at medical personnel. Posted by RT Play on 12 ноября 2015 г. 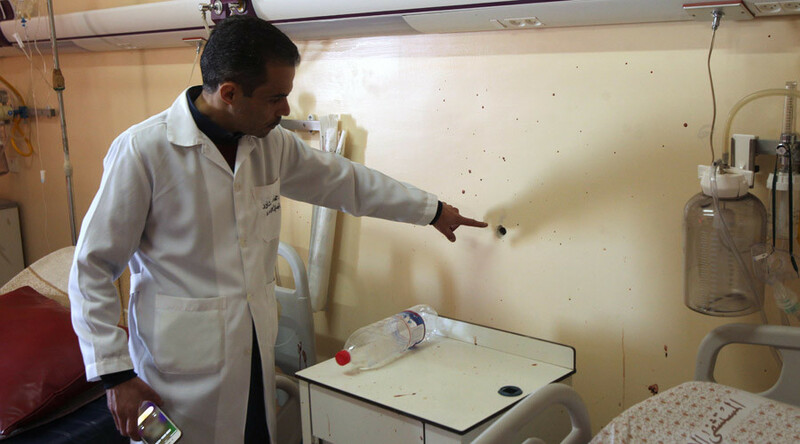 “They held the staff at gunpoint and stormed the room of al-Shalalda,” Shawar said, as cited by Reuters. Al-Shalalda's brother Bilal was reportedly in the same room and was tied to the bed by the Israeli operatives. Another man, al-Shalalda’s cousin, was shot dead moments later. “As soon they entered the room they tied me to the bed. [My cousin] was inside the bathroom and wanted to wash for prayer. As he was exiting the bathroom, one of the undercover men shouted at him to stop and they opened fire,” Bilal told Reuters TV. Afterwards the Israeli operatives captured Al-Shalalda himself, put him in a wheelchair and got out of the room while not allowing medical aid for the man who was shot. “[The cousin] remained on the ground bleeding and they hit [Al-Shalalda] my brother on his head and took him away,” according to al-Shalalda’s brother Bilal as quoted by Reuters. Israeli military claims Abdallah Azzam al-Shalalda is suspected of carrying out a stabbing against a settler. His victim allegedly tried to retaliate but al-Shalalda managed to escape. A spokeswoman for the military suggests he and his family, including the cousin who was shot dead, were “known Hamas operatives,” according to Reuters. The assault and shooting at a medical institution has caused outrage on social media. Violence across Israel, Jerusalem and the West Bank has been climbing, with the number of stabbing attacks on Israelis by Palestinians on the rise. At least 12 Israeli citizens were killed by Palestinians, while the death toll for the Palestinian side is nearing 70 people shot in response by law enforcement or security forces. The conflict has escalated amid Palestinians’ fears they could be banned to pray at Al-Aqsa mosque, which is of great significance for Muslims. Under current arrangements, Jews are allowed to visit the site, but non-Muslim prayers are banned. In October, Israel reintroduced a ban barring Muslim worshipers under 50 from entering the mosque for Friday prayers. The move was announced by Israeli police as part of broader measures focused on tightening security in the Old City.